If there is one thing that keeps my kids busy, it is animal figures. I keep a small bag of them in my purse at all times and when we get stuck somewhere, I pull them out and the kids are thrilled. My kids love the little animals so much, I thought they would make the perfect little valentine! Print and cut out the printable Valentine. Have your child address them. Punch a hole on either side of the the valentine. Slide baker’s twine through both holes and tie the small animal to the front of the card. 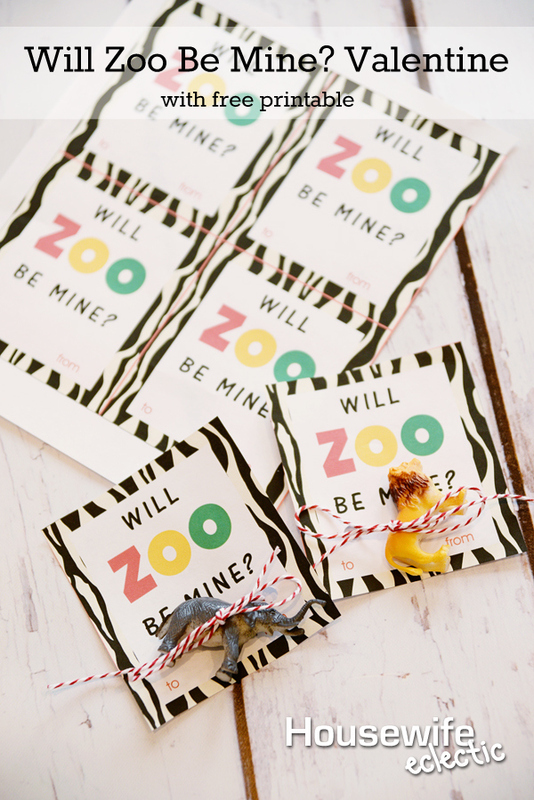 I was able to find a small bag of animals at the dollar store, which made this valentine super affordable to make. I think the kids are going to love getting a little animal instead of just another sucker. Do your kids love little animals as much as mine? That is a super cute valentine. Perfect for the kids to bring into school! Oh these Valentines are super cute! I'm totally going to use this with my dayhome kids. They are going to love this! You always have the most adorable printables. I love your clever play on words as always! Whats next? Those are the cutest valentines! What a great idea and play on words! That is just too cute! And I love how its a little different from your traditional children's valentine. I am always looking for crafts to do with my niece. this is just too adorable. Great idea! My son loves animals and yes, we have a few in the car that he plays with. 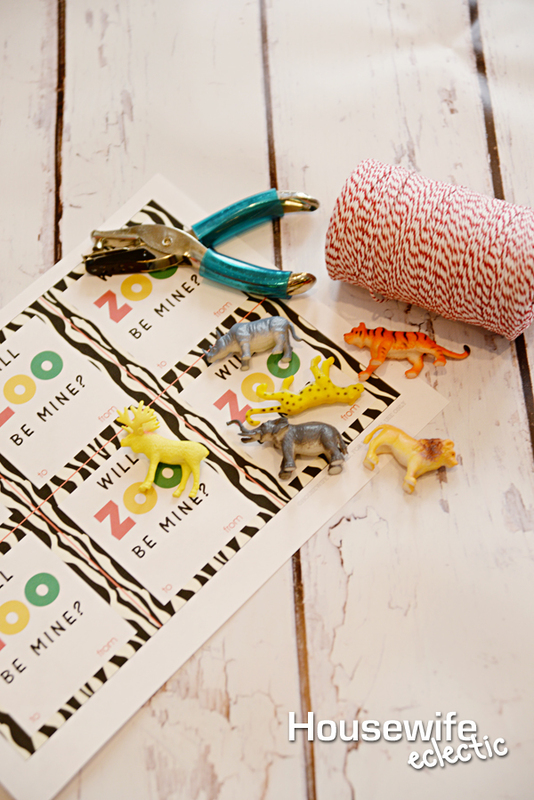 Adorable printable! Love this idea! It's so perfect for the little ones and definitely the cutest Valentine's Day idea I have seen so far! These valentines are super cute! I am so lame when it comes to valentines. I just buy the boxes. I need to get creative! My son loves animals and these would make great Valentine's! I'll have to make some too! Those are adorable! I need to make a trip to the dollar store this weekend, so I think I will try and find some little animals for the kids' valentines for their party next week! These are adorable valentine's cards! And I think giving out little toys is a much better idea than candy. Sometimes the holiday's that emphasize giving out candy can get a little over whelming! What a fun idea. I should put a bag of cars in my purse. That would keep my kids entertained. These are adorable! Those little animals will keep the kids enteratined. Very cute idea. Yes, my daughter is totally nuts over animals. I have the same thing in my purse lol. I love the printable! Those are cute. This year I printed out ones that say YOURE A GEM OF A FRIEND and we're going to put tie ring pops on them. So fun, right?! My kids go crazy over zoo animals so this is perfect! This reminds me of the animal theme room my son had when he was little. He loved it! Omg these valentines are just wayyyy too cute!!!!! I can't believe my daughters school party is this week! Craziness! These Valentines are so cute! Thanks for sharing at Merry Monday, hope to see you again next week!